What is there to say about gravure? That the cells transfer ~40%, and that's it. Recent practical and theoretical work on cell emptying provides some insights into what is going on, but they don't really help much. Sorry! There is surprisingly little to say scientifically about gravure printing. This is partly because there are so many confusing variants, but mostly because the actual process of getting stuff out of the gravure cells and onto the substrate is poorly understood and quantitative rules are hard to come by. Even if we had ideal gravure cells with known shapes and angles we have no way to produce accurate predictions. But real gravure cells are far from uniform, so prediction is even harder. Still, that doesn't excuse the general ignorance of how the ink, in principle, gets out of the cell. Once again, my colleague at U. Leeds, Prof Nik Kapur, came up with the answer which is rather simple to show but difficult to compute. It was gratifying to subsequently find that Prof Carvahlo1 at Pontifícia Universidade Católica do Rio de Janeiro was able to show some of these effects using excellent fluid dynamics. 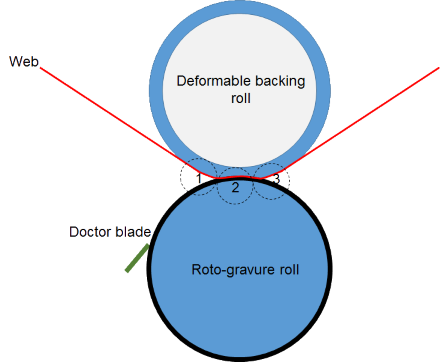 The basic setup is the gravure (or "anilox") cylinder pressing against the substrate which itself is against a deformable roll so that sufficient pressure can be applied. The following diagrams show the process at the three stages marked 1, 2 and 3 in the image above. This is simple. The cylinder with cells full of ink comes into contact with the substrate and air trapped between is expelled. Nothing much going on here. The ink is now fully in contact with the substrate. If the substrate is porous then ink will start to flow. But if we assume a non-porous substrate, nothing else can happen. Stage 3 Separation. Where does the ink go? Now the interesting bit. As with screen and flexo, the question is how does the ink flow? In this case it starts to stretch up to the departing substrate and air has to move in somewhere, along a meniscus moving into the cell. Depending on many complex factors, the thin "liquid bridge" of ink is going to snap (causing, incidentally, a characteristic satellite drop which might reduce the print quality) leaving X% on the substrate and Y% in the cell. What are X and Y? As you can see, it's going to be a very delicate balance between all sorts of factors. If the ink is very-much pinned to the edge of the cell then the meniscus won't flow into the cell and only a tiny dot gets printed. Depending on the speeds and radii, the side-ways distortion of the liquid will be less or greater, affecting when the liquid bridge will snap. This is why no-one can predict the ratio other than to give a rule of thumb that somewhere between 50% and 70% will be printed and 50% to 30% will return uselessly to the system to be, we hope, recycled. But if there is any evaporation on the way back, there is nothing to positively displace the remaining fluid so it will, over time, thicken up and get stuck in the bottom of the cell, reducing the overall ink transfer with time. 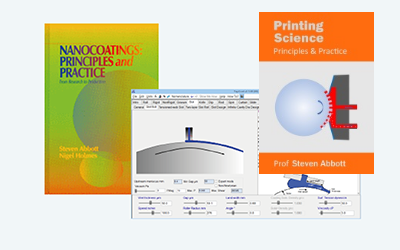 1Diego M. Campana and Marcio S. Carvalho, Liquid transfer from single cavities to rotating rolls, J. Fluid Mech. (2014), 747 545-571.